The Baltimore Orioles had a four-game win streak through Sunday. They lost today, 6-4, to the Minnesota Twins. A new win streak starts tomorrow. 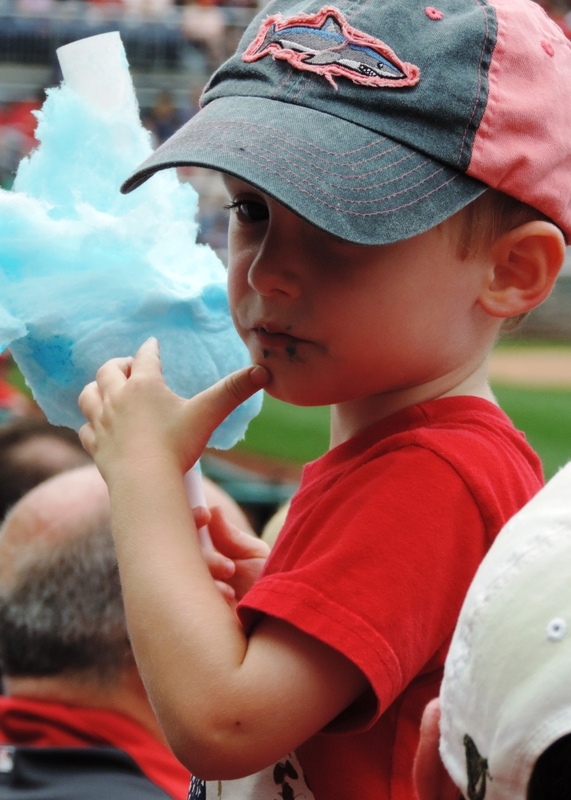 In the meantime, here’s a kid eating cotton candy. And, then looking both wistful and a tiny bit barfy at the end. 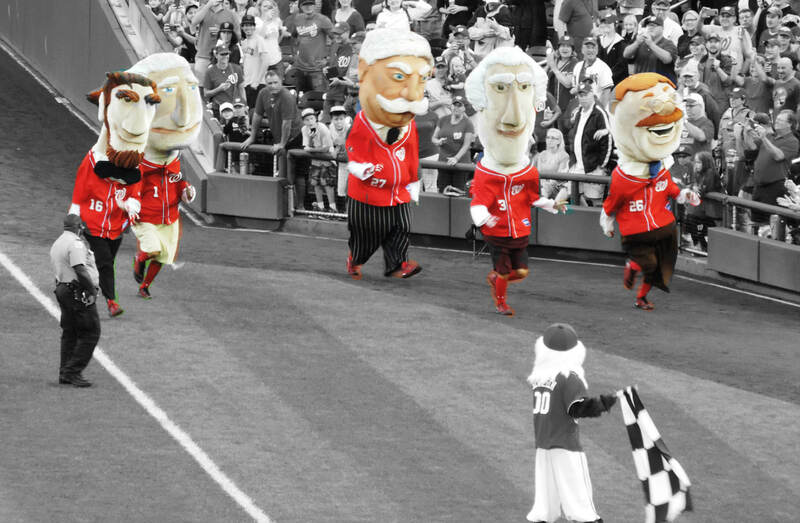 Also from our recent trip to a game at Nats Park in Washington, DC, here are the Racing Presidents. 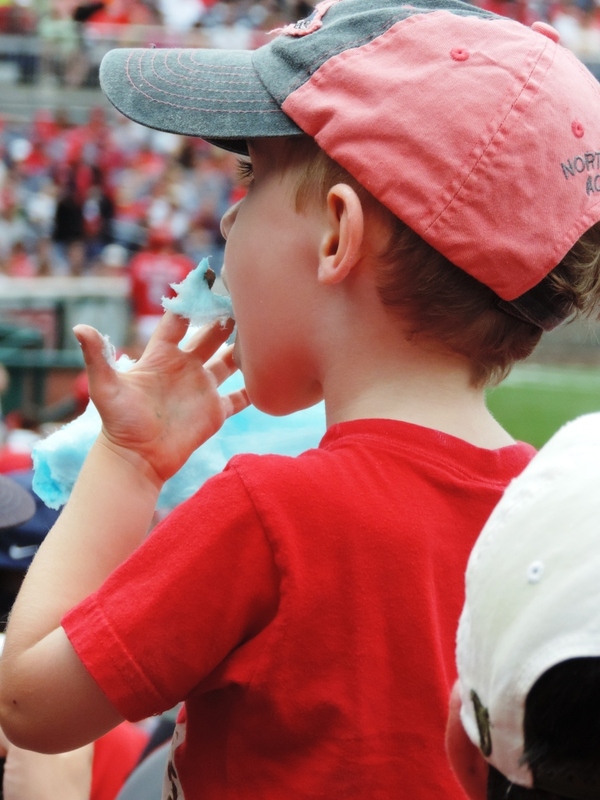 This entry was posted in Baltimore Orioles, Baseball and tagged kids, mascots, photography, SF Giants, Washington Nationals by Jackie, The Baseball Bloggess. Bookmark the permalink. It’s been a couple of seasons, but the last time I braved the crowd and the elements at O.co (dilapidated home of the As — and no, there’s no “m” at the end of the name), they had cotton candy in yellow and green. Team colors, don’tcha know. 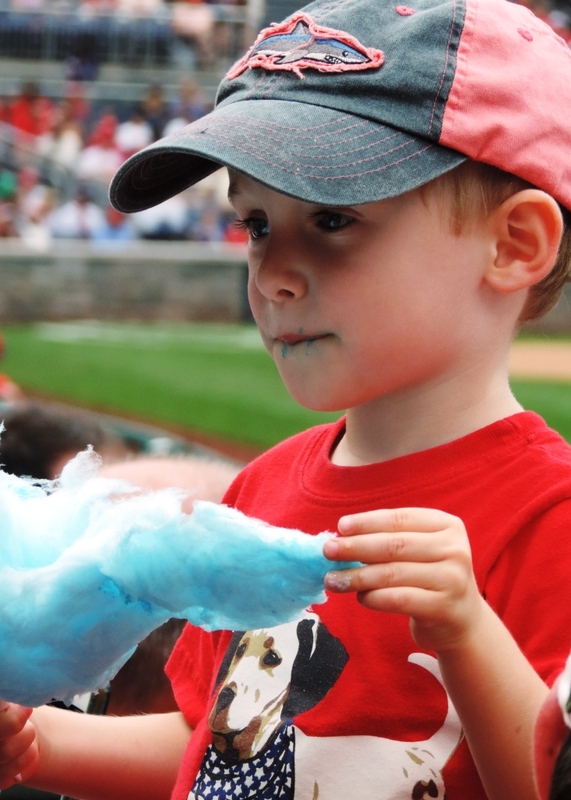 I hesitate to speculate on the possible effects of yellow and green coloring agents on the inevitable result of eating too much cotton candy. I post this in the hope that it *will* jinx the As, who just broke a four game losing streak by jumping on the Mariners for five runs in the first inning. Feh! Yup. Tricky stuff, this magical thinking. No jinx on the Giants, so far, although we are still in the 7th inning. And A’s returned home from a four-game sweep at the hands of the Angels to beat Seattle convincingly. Was out at the O.co (dilapitated home of the A’s, which as you may remember has no “m” at the end of the name). It was a beautiful day for a game and A’s picked up a half game in a steep uphill climb. 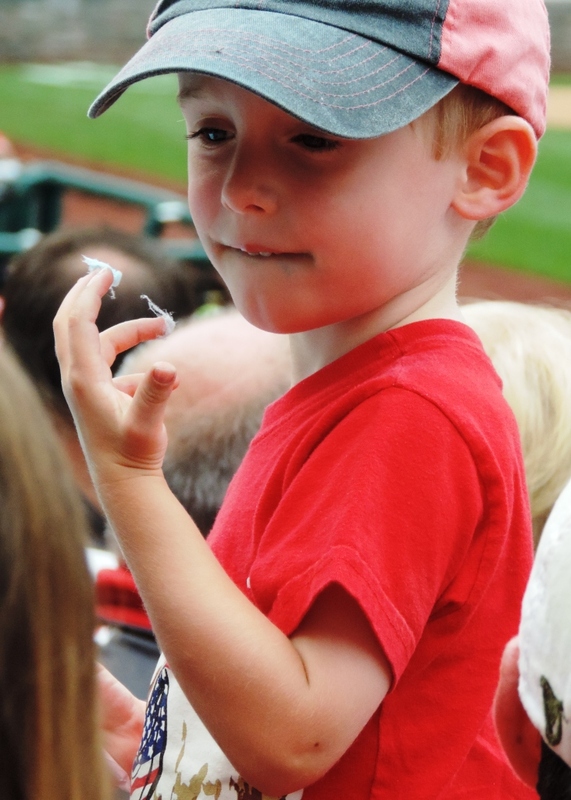 There was cotton candy all around. Way too colorful and sweet. I was glad to see that Jason Hammel pitched well today. But, I’m still pretty sore at the A’s for the way their fans treated Jim Johnson during his brief time there. (It all goes back to the don’t-boo-your-players thing.) And, there’s that bit of bad blood the cropped up between the A’s and O’s this season (the Battle of the Vowels).